Would you like to collaborate with CAPI? The Center for Advanced Preclinical Imaging (CAPI) was created to apply the most advanced imaging technologies for basic and applied research carried out not only by scientific teams from the First Faculty of Medicine at Charles University in Prague but by researchers from other scientific institutions in the Czech Republic and the European Union. CAPI participates in two consortia, CzechBioImaging and EuroBioImaging. In addition to in-vivo imaging services, CAPI is also involved in the development and testing of new imaging probes and technologies as well as teaching students and performing in-house research. 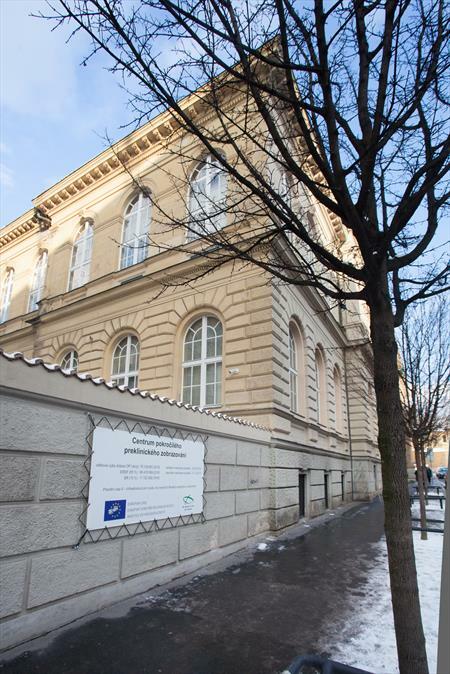 CAPI opened in 2016 and was created with the support of the Czech Ministry for Education, Youth and Sport's Operational Programme Research and Development for Innovation (OP RDI). We are a multimodal imaging center equipped with the latest technologies, enabling examination of small laboratory animals (mouse, rat) by means of X-ray, CT, MRI, MPI, PET, SPECT, and optical imaging using fluorescence and luminescence, ultrasound and photoacoustics. All these methods can be combined for one anesthetized animal and the images can be merged. Measurements can be made for up to four animals simultaneously. The devices have integrated anesthesia for maintaining body temperature of an animal and monitoring its vital signs (ECG, respiration, blood pressure, video monitoring). The Center can perform longitudinal studies. Animals are housed in individually ventilated cages (IVC). Head of Department: RNDr. Luděk Šefc, CSc.